Salome, Arizona, is a beautiful town located in the McMullen Valley, which is situated on Highway 60 between Quartzsite and Wickenburg. Salome’s natural desert and open land draw many visitors who come to hike, off-road, and explore. Rich in history and tradition, this area boasts gold mines, wildlife, beautiful sunsets, and peaceful landscapes. 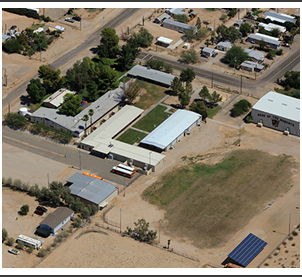 Our district is located in La Paz County in Salome, Arizona. We educate over 140 students at Salome Elementary School. Although our district is small, we are committed to our students and dedicate ourselves to providing a top quality education. The mission of the district is to provide comprehensive, success-oriented learning activities for young people in our school. These opportunities must be designed to develop the person's potential in the areas of academic ability and vocational awareness, cultural appreciation, physical well-being, social development, and community contribution. 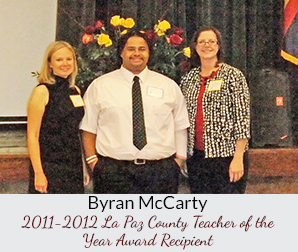 Each year Arizona Rural Schools Association (ARSA) presents prestigious awards to outstanding Arizona educators. Join us in congratulating members of our teaching team that have been selected as the County Teacher's of the Year. Award winners receive plaques acknowledging their achievements and recognition. 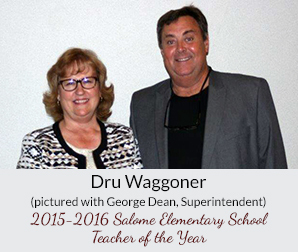 We proudly recognize the following teachers at Salome Elementary School for their excellence in providing a superior educational experience for our students. Our financial and performance reports are available online as a matter of public record.